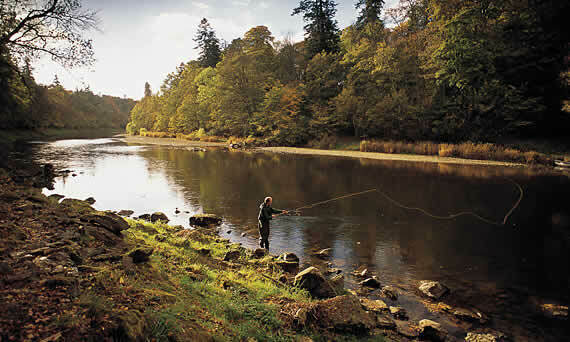 The club offers all year round fly fishing, mostly in the spectacular scenery of North Wales. We have a range of venues to suit most anglers, from the purist looking for wild brownies in a small tributary, to the angler trying for bigger quarry in the wider waters. Our members enjoy access to some forty miles of the best river fishing for salmon, sea trout, wild browns and winter grayling. The Welsh Dee is reknowned as one of the top rivers in the country for winter grayling. For the still water angler there are lakes available, most of them stocked with rainbow and other trout varieties. There is a busy calendar of Outings organised throughout the season with visits to some of the more popular commercial lakes, including Llyn Brenig. We hold a Club Meeting on the first Tuesday of each month in our home base of Hoylake. The meetings are popular and well attended with a varied agenda to suit most members. There may be a professional speaker, a video, a field night of Casting Tuition with a professional trainer, a session of Fly Tying. Each year we hold a Tackle Auction. At the end of the season there is a Hotpot Supper when prizes and trophies are presented to the winners of the various Competitions. Above all, the meetings provide members, especially new members, with the opportunity to forge frienships and we all learn from others who share the same passion for the sport and who are happy to pass on skills, knowledge and expeience. Club Membership runs from January 1st to the end of the year. For any enquiries about the club please use our Contact Us page. An ideal site for checking river levels is the Environment Agency site. Before going anywhere to fish be sure you have a licence. To purchase a licence online Click Here. Angling Trust and their Insurance Scheme which is run by Insure4sport. This covers our club and all its members quite comprehensively for most fishing activities. We are in full support of the aims of the Angling Trust and of the Environment Agency. Our members participate in working parties aimed at controlling invasive weeds and clearing the ubiquitous litter. To increase print size use "CTRL" with "+"..... To decrease, use "CTRL" with "-". Copyright 2015, Hoylake Flyfishers. All rights reserved.